Lighting controls are expected to continue to dominate Europe's smart home market, owing to, the growing demand for the energy efficient lighting solutions by the consumers. Moreover, the lighting control systems help in reducing the carbon footprint, lowering energy consumption cost, complementing the home design and in enhancing the lighting management in a smart home are propelling the growth of the lighting control application in Europe's smart home market. 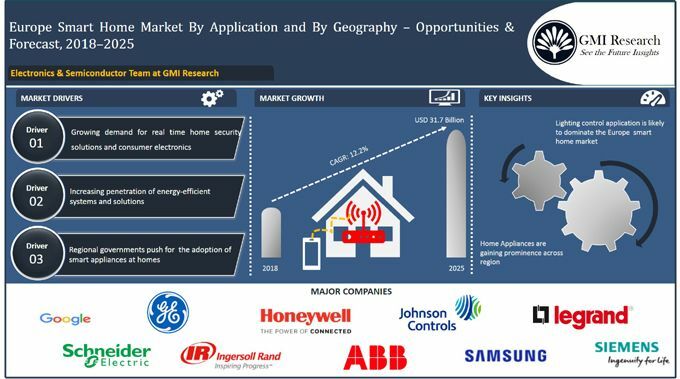 The research report "Europe smart home market" provides in-depth analysis of Europe smart home across the region, based on applications and key countries for the forecast period from 2018 to 2025. The report highlights the major market drivers propelling the growth as well as challenges faced by the market participants. The research report also provides market size and forecast for the Europe smart home market. The report also analyses the competitive landscape, major players and their strategies in 2018. The competitive landscape section of the report captures and highlights the recent developments in the market.